Today fellow bloggers are helping Pam Penick launch her new book The Water-Saving Garden: How to Grow a Gorgeous Garden with a Lot Less Water. There's also a nice giveaway for a lucky reader at the end of my post. I'm excited to help get the word out about Pam's new book on water-saving gardening since I've followed Pam's blog Digging for years, loved her first book Lawn Gone!, and now she has even upped her game with her second book. Love the cover! 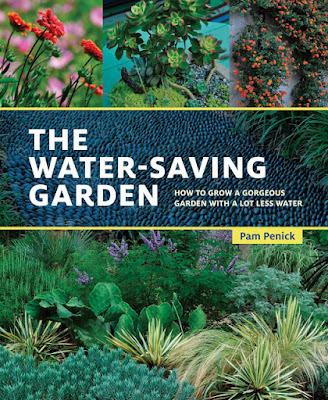 Pam knows her subject well since that's her own gorgeous water-saving garden on the cover. Having made her case for ditching lawn in her first book Lawn Gone!, Pam moves the conversation forward to answer our questions about what's next. In a writing style that's just like chatting with her about gardening, she goes beyond the basics as she shares her thoughts and experiences so you can choose the best approach when designing your own water-saving garden. Gardeners interested in saving water often express similar concerns that water-saving gardens are basically ugly and the neighbors will object or it's more work than a lawn. In Part One of The Water-Saving Garden: How to Grow a Gorgeous Garden with a Lot Less Water Pam addresses such concerns with detailed tours of beautiful water-saving gardens from different geographic regions of the country. Pam's usual awesome photos serve to further inspire us. She then leads us through the steps to our own gorgeous water-saving garden while dispensing her practical wisdom along the way. Part Two is packed with information on holding that precious rainfall whether through rain barrels, swales, terraces, or rain gardens. Using chapter titles like "Think Saltines" for permeable paving or "Irrigation Without Irritation" she holds our attention with humor while dispensing advice on everything from soils to shade sails. One of my favorite things about the book is that Pam doesn't shy away from sharing her opinions. Just in case you missed reading her first book Lawn Gone!, there's more encouragement to "Lose the Lawn" in Part Three. She challenges lawn keepers to consider their reasons for maintaining turf grass. While understanding everyone has their own views of what looks best, she gently prods us to action. No, you aren't limited to cactus and rocks. As she demonstrated with tours of gorgeous water-saving gardens in Part One, there are many great options with no one right or wrong way to approach water-saving gardens. Pam covers the subject of creating the illusion of water in Part Four, showing how plantings, stones and other features can evoke a sense of water in the garden. I particularly enjoyed this part of the book on the important role of water features or sense of water in a water-saving garden as her treatment of the subject is something I haven't seen emphasized quite this way before. 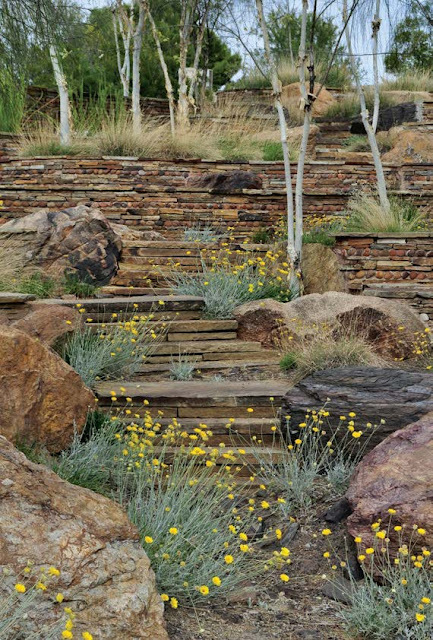 Flowing stone steps in a desert garden. The last section is devoted to 100 favorite water-saving plants beginning at ground level with groundcovers and topping out with trees. I noted a number of my own easy care, low water favorites like Pine Muhly and Butterfly Vine on the list. Even if you live in a region where water is plentiful, Pam's ideas will help you conserve this important resource. Either stand alone or as a follow-up to Lawn Gone! Pam's new book is packed with practical advice on creating a gorgeous water-saving garden. You can find The Water-Saving Garden: How to Grow a Gorgeous Garden with a Lot Less Water at Amazon and other online booksellers. Fine print: An advance copy of The Water-Saving Garden: How to Grow a Gorgeous Garden with a Lot Less Water was provided to me by the publisher without obligation. This review reflects my own views and is the same review I would write had I purchased the book myself. All photos reprinted with permission from The Water-Saving Garden, by Pam Penick, copyright © 2016, published by Ten Speed Press, an imprint of Penguin Random House LLC. Photographs copyright © 2016 by Pam Penick. Update: And the winner of the Flat Back Rain Barrel with Chesapeake Stand from The Rain Barrel Depot is Martha from Austin! Thanks to you all for your interest in The Water-Saving Garden and for entering the giveaway. Flat back design allows the barrel to sit close to the wall. Other great features include brass spigot, screening to keep out bugs, and a front overflow to direct excess water away from the house. And the generous folks at The Rain Barrel Depot will include the sturdy Chesapeake Stand for your new Flat Back Rain Barrel. The Rain Barrel Depot website is fun to browse. Great styling, recycled materials and prices include shipping. They also carry DIY kits so I can finally convert that old water softener container into a proper rain barrel. Videos on the website show how easy it is to install. For your chance to win the flat back rain barrel and Chesapeake stand from The Rain Barrel Depot, just leave a comment below and the winner will be selected at random on Monday, March 7, 2016. A few rules: One entry per person for each giveaway, and you must provide an email address so you can be notified if you win. If you prefer to keep your email private, just send it to me using the contact form on the right sidebar under my profile and I'll delete it after the winner is notified. (Please note, the contact form will not count as a comment.) Shipping available within the continental U.S. only (excluding Alaska and Hawaii). I got the book last week and just love it. Pam is an excellent author and her book is full of useful information and wonderful photos. I would love to have another rain barrel. Thank you, littledutch! I'm happy to know you're enjoying the book! This would be an excellent replacement for twin rain barrels I've had for 20+ years. Please count me in—with thanks. One can never have too many rain barrels in my view! Thanks for being a "Digger" (reader of Digging)! I'm glad to hear you find good ideas there. I have Pam's first book but still too "chicken" to go lawn free. Hate San Augustine but really resent having to water it in summer just to keep it alive. What worries me is it seems you will need a lot of "hardscape" (expensive) in place of lawn for your property to look nice and not an eyesore for your neighbors. Hi, backacre. Thanks for reading Lawn Gone! Your concern about what to do instead of lawn is very common, and I don't think you're chicken at all -- just pragmatic! Just remember, it doesn't have to be all or nothing to make a difference, and you can take out half your lawn and replace it with low-growing grasses or sedge (if shady), some groundcovers, and low-growing shrubs for a pleasing mix that'll encourage pollinators to visit and make your neighbors happy to. A small gravel patio near the front door for a bench or a couple of chairs is neighborly and doesn't cost as much as fancy stone or pavers. 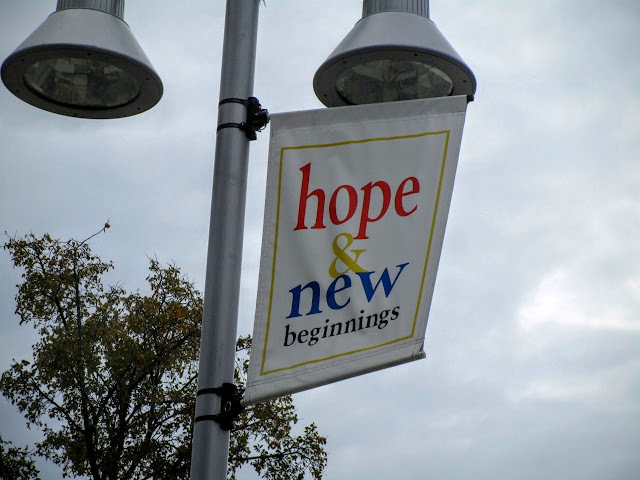 There are lots of options, and I'm sure you'll find one that works for you. Happy digging! What a perfect prize to go with this book! Thank you for the chance to win it! I was just thinking that we need a second rain barrel! Wow, Pam's new book looks great! And I would love to win a rain barrel! I was honored that Pam included a photo of my garden in her first book. I am looking forward to her second one. Please enter me in the giveaway. And I was so pleased to include it because it was a beautiful example of what you can do instead of lawn. I know your new garden will be equally lovely, Phillip. Happy digging! Great ideas for landscaping dry climates. Can't wait to read it put the ideas to use! An awesome rain barrel would definitely fit into that plan! Of course, a rain barrel will only work if we get some rain... I can't wait to read Pam's for more ideas for my garden! Here's to (hopefully) rain in our future! Thanks for the chance to win! What a nice way to save water. I certainly could use it. Sometimes it gets very dry in the Summer and I have a lot of watering to do. Thank you for the chance. I love it! The subject of Pam's book is very important... our climate is certainly changing, and that barrel is looking more and more attractive! Thanks for being part of Pam's wonderful book and book party! Thanks for the giveaway! the photos in her book are gorgeous!!! Congrats, Pam! Can't wait to get my hands on Pam's book! And it will be fun to explore your blog! Thanks for the entry! Shirley, thank you for your thoughtful and detailed review of my book. I've gotten so much water-saving inspiration from your own blog and garden over the years, and I'm thrilled that you're joining me in the book-release party and giveaway. The rain barrel and stand from The Rainbarrel Depot will make a terrific prize for some lucky winner! This is such a simple solution for water that has been overlooked in recent generations. Both of my gardening Grandmother's, born just after 1900 had rain barrels. Love the ideas in this book. Can't wait to read it in full. Love the give a ways. Thank! Would love to win the 50 gallon rain barrel and Chesapeake stand. I would love to win this for our garden!! Rain barrels are awesome. I'm looking forward to reading the book and I could sure use the barrel. 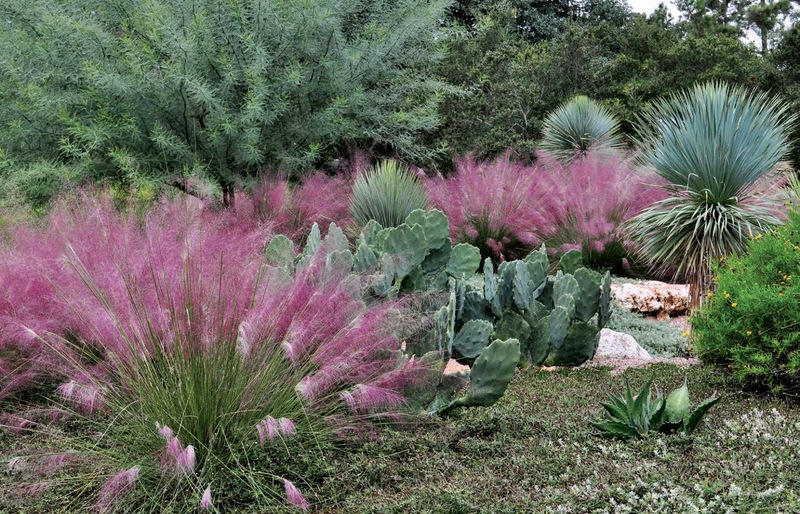 Pink muhly grass is a favorite! A rain barrel would be really helpful in my garden! No summer rain makes for a need to be cautious in what I plant. I am adding your blog to my reader. I found from Digging. I came back again as I forgot to put in my email. Taylor1584@aol.com. Then I started skimming. I have come to the Riverwalk twice fro Houston. Never new there was more walkways along the river besides where all the action is by the hotels. Now I want to come back and do the walks that you posted about. Thanks for doing that with great pictures, now I know where to go. That's wonderful to hear that I've inspired you to go beyond the tourist areas and see our beautiful city as we do. While we have a huge 525 gallon water reservoir tank that was provided to us by a local company many of us at our community garden are looking at ways to be able to "harvest" our own water source. These rain barrels combined with a low cost fenced gutter system look perfect for our needs! Great work! A rain barrel that is pretty AND smart. I love it! Shirley, I always enjoy your posts. Keep 'em coming! And, I'd like to be considered for Pam's Book drawings! Great water barrels! Would love to install 2 of them in my garden! I've been adding more and more native plants to my landscape over the last several years and really see the benefits - my garden looks more lush, I have less work to do, I spend less money on water and replacing plants, and I attract much more wildlife. Now, I have a wish-list and project list of other water-wise techniques to add to my garden, including getting a rain barrel. I'm sure my lists will only grow after I read Pam's new book! I am so excited about Pam's new book and what a wonderful giveaway. That is a great rain barrel that anyone would love in their garden, even me especially during those drier hot summer veg garden times...thanks for this opportunity Shirley! Tropical Color for Valentine's Weekend!